How to Easily Master Format XIAOMI REDMI 3S / 3X with Safety Hard Reset? Tips and tricks to fix XIAOMI REDMI 3S / 3X with several options. This phone have 5 inches LCD screen which use latest MIUI 7.3 for beautiful user interface. The factory default operating system use Android Marshmallow version 6.0.1. We can choose to have 32 GB or 16 GB internal memory. The community of www.hard-reset.org will give more information about how to fix this phone. Basic differences for International model of XIAOMI REDMI 3S does not have fingerprint sensor while XIAOMI REDMI 3X have fingerprint sensor by default, internal memory at XIAOMI REDMI 3S 1s 16 GB while REDMI 3X is improve become 32 GB, but all specifications is not different, therefore the steps to fix this phone also similar. How to Upgrade XIAOMI REDMI 3S / 3X to Android Nougat or Android Oreo firmware update ? When the first time release in the market, this phone use Android Marshmallow. There are some version of firmware release version for XIAOMI REDMI 3S / 3X, but when the time we make this information, Xiaomi still not release official Android Oreo or Android Nougat update for XIAOMI REDMI 3S / 3X. We can try to find-out our self anytime whether XIAOMI REDMI 3S / 3X already get latest Android version or not from menu Setting > About for OTA (over the air). However, at the Internet, we can find several custom ROM which an upgrade our XIAOMI REDMI 3S / 3X to Android Oreo or maybe Android Pie next development, but some of them still beta version and only recommended for testing purpose. There are some bugs that can make our activity not work normally with this version. Therefore please think carefully before we decide use non official custom ROM Android update at our XIAOMI REDMI 3S / 3X. How to Fix or Problem Solving for Recovery XIAOMI REDMI 3S / 3X hang or not responding or malfunctions or stuck or freezing or bricked ? Both type of XIAOMI REDMI 3S and REDMI 3X have external memory slot if we need more storage, but the external memory will share with SIMCARD 2 slot. Therefore if we want to use external memory, then we have disable simcard 2 GSM (only simcard 1 is active). Using 16 GB or 32 GB internal memory still have some space to install interesting applications from Google Play Store like Skype, Whatsapp, Viber, Instagram, WeChat, Line Messenger, Blackberry Messenger (BBM), SnapChat, Facebook and many more. But if we are interesting to try new applications, then we have to read as many users review as possible, because some new or not famous applications from Google Play Store may contain viruses or malware. That apps can make our XIAOMI REDMI 3S / 3X become hang or stuck or bricks or frozen or bootloop logo or LCD touch screen not responding, we have to force shutdown or force soft reset or force reboot to restart all running applications or clean temporary files caches. After our XIAOMI REDMI 3S / 3X can boot again, then try to install one good anti virus applications like AVG or AVAST or NORTON, it will scan all installed applications. If the problems still not fix, then we have to do hard reset or master format. Please remember, doing hard reset will erase or wipe all important data or photos or videos from XIAOMI REDMI 3S / 3X, therefore we have to backup before performing hard reset. Master format will remove all installed Google account at XIAOMI REDMI 3S / 3X. How to backup data or Contact at XIAOMI REDMI 3S / 3X? Backup all important data when we have time to do that, because we never know when our XIAOMI REDMI 3S / 3X will get any trouble. We can use microSD external card to copy or move important files using File Manager applications. If our XIAOMI REDMI 3S / 3X has already signed in with Google account, by default our contact will be synchronize in the background to Google server. Please make sure we check all contact at Google contact server using Internet browse to make sure backup is done. How to Force Shutdown or Force Soft Reset or Reboot or Restart XIAOMI REDMI 3S / 3X ? When some trouble happen, the LCD screen of XIAOMI REDMI 3S / 3X can become not responsive with our finger touch or in the middle of running applications. We have to force shutdown or force reboot to clean temporary files caches. 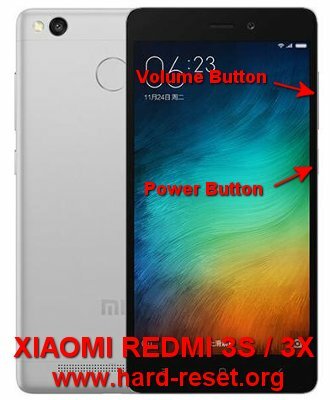 Please press and hold POWER button until XIAOMI REDMI 3S / 3X turn off by itself. Don’t worry to do this process, because it will not remove any important data, therefore we can do it anytime we want. If our XIAOMI REDMI 3S / 3X still work but we need to restart all running applications and remove temporary files caches, then turn on LCD screen, and continue press and hold POWER button until pop-up menu appear, then choose Shutdown / Reboot / Power off menu. The XIAOMI REDMI 3S / 3X will do the hard reset or master format to factory default process. How to Boot Recovery Mode at XIAOMI REDMI 3S / 3X ? If we need to boot our XIAOMI REDMI 3S / 3X go to recovery mode. We can follow the steps at #Option 2 above from steps no.1 until no.4. After that steps finish, then we will find list of menu options, and choose Recover menu or any other menu as what we need to do. How to Restore and Reinstall Clean Android Operating system / firmware at XIAOMI REDMI 3S / 3X (Reformat) ? The operating system of XIAOMI REDMI 3S / 3X already installed when the first time we use this phone, it will ask for Google account whether old Gmail account or new sign-up account. But if we install some applications, sometime they can crash and make XIAOMI REDMI 3S / 3X operating system become damage or corrupt, this phone become not normal. We have to reinstall or reformat with factory default one. First we have to know, clean factory default Android operating system file source already saved safely inside XIAOMI REDMI 3S / 3X ROM or internal memory, so we do not need to copy or connect with other device. Just follow simple steps to hard reset above, then clean factory default Android operating system will be reinstall automatically. There are also other alternative to reinstall or restore the XIAOMI REDMI 3S / 3X operating system by download the official MIUI ROM for XIAOMI REDMI 3S / 3X at Xiaomi website, copy the downloaded file to external card SDCard using computer with card reader, or connect directly our XIAOMI REDMI 3S / 3X to computer and it will read as removable drive. Copy the downloaded files at external memory and please continue by using XIAOMI REDMI 3S / 3X applications which have name Updater. Follow the menu to finish the upgrade. How to Unlock or Fix or Bypass or Solutions for XIAOMI REDMI 3S / 3X forgot password code or security lock screen pattern or pin (lost password)? XIAOMI REDMI 3X have fingerprint sensor, but some type of XIAOMI REDMI 3S does not have fingerprint sensor. However, we still can use password pin or pattern to protect our important data when this phone away from us or stolen or lost. Especially because this phone have good 13 megapixel main camera at back body and 5 megapixel front camera for selfie photography. The problems happen when we forgot security answer, what should we do? Do not worry, because we can bypass or unlock forgot security screen lock pattern or password pin protections using Google account. Please turn on XIAOMI REDMI 3S / 3X, when ask for answer, then try to give several time wrong answer continuously until XIAOMI REDMI 3S / 3X freezing or locked 30 seconds. We can find Forgot Password / Pattern button, press this button then we can give our Gmail username and password that we have already signed in before. If we can not access our Gmail account, then we have to do hard reset using hardware button combination key. How to Improve Performance XIAOMI REDMI 3S / 3X to make run more faster? Both XIAOMI REDMI 3S and XIAOMI REDMI 3X use the same processor Qualcomm MSM8937 Snapdragon 430 which have 64 bit Octa-core 1.4 GHz Cortex-A53. Base by several benchmark reviews, this phone have give good performance for run applications and play games without lag because it have dedicated GPU (graphic processor unit) Adreno 505. But why some XIAOMI REDMI 3S / 3X get slowly trouble? Usually because applications. First we have to know that some applications at Google Play Store or offline APK applications will keep run in the background to wait data update like social media, games or chatting. All apps will use RAM, therefore if many of them run together, then our XIAOMI REDMI 3S / 3X RAM and processor resources will be insufficient. Therefore we have uninstall some not use applications. If we want to make our XIAOMI REDMI 3S / 3X performance run faster again like new, then please consider to do hard reset or master format. Is that any other secret code of hard reset XIAOMI REDMI 3S / 3X? At this moment, there is no other secret code or secret key to do the factory reset of XIAOMI REDMI 3S / 3X Just try to do the hard reset above. How to Make Battery of XIAOMI REDMI 3S / 3X Stronger, Life Longer and Not Fast to Drain ? XIAOMI REDMI 3S / 3X have similar battery capacity with REDMI 3 PRO which have 4100 mAh capacity. With 5 inches LCD screen we can use this phone more then one day for daily activity. But some users maybe need more adjustment if using LCD too much for playing games or watch movie. First we have to adjust LCD brightness as low as possible, because LCD east much battery power. We also have to disable all not use connections like GPS or Wifi or Bluetooth or Infrared to save battery capacity. [A] Hi, please follow steps at #Option 1 above if your Xiaomi Redmi 3S still can boot and go to menu Setting. Otherwise, you have to do hard reset using hardware button combination key like steps at #option 2 above. The information from this page describe about redmi 3s pc hardreset software,redmi 3x hard reset. If you need another resource for hard reset, use search function at this homepage or find from our related posts. How to Easily Master Format XIAOMI POCOPHONE F1 with Safety Hard Reset? How to Easily Master Format XIAOMI REDMI NOTE 4X with Safety Hard Reset? Hi, please follow steps at #Option 1 above if your Xiaomi Redmi 3S still can boot and go to menu Setting. Otherwise, you have to do hard reset using hardware button combination key like steps at #option 2 above.